Morning broke to very hazy conditions, no wind, a flat sea and a long postponement ashore. When the fleet finally arrived on the course area in the early afternoon, the wind still wasn’t fit for racing and a small further delay ensued, but finally a sailable 8-9 knots built under the blues skies for the first race of the day, before dropping off to 4-5 knots for the second race. 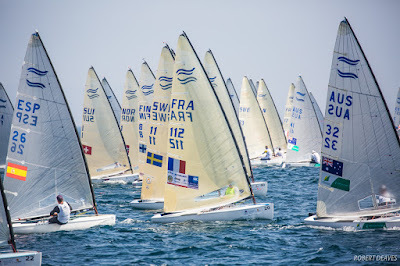 Jake Lilley, from Australia, made the best of the first upwind in Race 3 to round ahead of Britain’s Henry Wetherell and Deniss Karpak, from Estonia. Heiner rounded fifth, but had moved up to first on the downwind to take the inside overlap at the gate from Karpak. He extended up the second beat to win his second race of the series. Wetherell hung for second, while Lilley reclaimed third after Karpak was scored as an early starter, his second of the week. Regatta leader Lobert was struggling mid-fleet, but then picked up a second yellow flag for a Rule 42 infringement on the final downwind and had to pull out of the race. The wind had dropped slightly for Race 4, and keen to make amends for a bumpy start to his week, last year’s winner, Alican Kaynar, from Turkey, led at every mark to take a satisfying race win. Lobert was also back to form, rounding the top mark fourth before climbing up to second at the finish. Finland’s Tapio Nirkko had rounded the top mark in second, but had to settle for third at the finish. He had been the biggest climber in the first race, having rounded the top mark in last place, but then clawed his way back 23 places to cross in 17th and end the day in eighth overall. There was always a way back if you were patient and tenacious enough. The best performance of the day was from one of the youngest sailors here. Ondrej Teply, from the Czech Republic, picked up a fourth and a fifth, to move up to fifth overall. He is in his last year as an U23 sailor, having won the title back in 2015. Racing for the Finn fleet is scheduled to continue at the later time of 14.30 on Thursday to allow other fleets to catch up to schedule. The opening series concludes on Saturday ahead of Sunday’s medal race.